Nothing warms up your space like an area rug. Getting the most out of your rug means keeping on top of routine cleaning and care. To extend the life of your rugs, establish household habits like taking your shoes off inside or switching to house shoes. Be sure you have a doormat outside of all entryways and a small area rug inside to catch dirt and keep it away from your rugs. Pro tip: An entry bench with storage in your front foyer or mudroom can help keep shoes organized. Slow passes are more effective than quick passes for removing deep down dirt. Many area rugs recommend keeping the beater bar off or in the highest setting when vacuuming. For those without that recommendation use the brush or beater bar to increase agitation and loosen the soil. Multiple passes are important to remove as much unseen dirt as possible, especially in high traffic areas. Woven rugs and rugs with open, woven or fabric backings can be flipped over and vacuumed from the back. This will help remove dirt and dust that has worked its way down into the rug fibers and backing. Blot up spills right away, blotting liquid with a dry clean cloth will absorb it out of the fibers. When solid spills are on top of the rug, use a cloth to pinch them up, work from the outside in, pulling it up and away from the rug. Do not rub or scrub, this pushes a stain into the fibers further. To remove spots or residual stains, first try warm water on a clean cloth and dab the spot, press the cloth into the rug and allow time for it to absorb any residual stain. If more power is needed, next try diluted soapy water. Add just a few drops of detergent dissolved in warm water and use a clean cloth to dab this solution into the spots. Follow with dabbing warm water to remove any residual soap. Finally, blot with a clean dry cloth to remove as much moisture as possible. If mild detergent isn’t strong enough for your stain, use a carpet cleaning product. Always test for colorfastness in an inconspicuous area. Check the manufacturer’s instructions for your rug and read the cleaning products instructions carefully. Use small amounts of cleaner, more product is not better and will simply make it more difficult to remove residual soap. Apply in small amounts from the outside of the stain inward, use a blotting technique only never scrubbing. Blot dry. Follow this by dabbing with clean water to remove residual cleaner, and finally blot dry. For periodic deep cleaning on larger rugs, especially those made from materials like wool, leather or natural grass fibers, professional care is recommended. Wool – New wool rugs will shed for the first several months, but will diminish in 3 – 6 months. 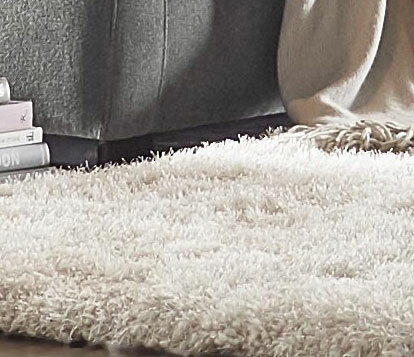 Vacuum your new wool rug a few times a week in the beginning without beater bars and using a low pressure vacuum. 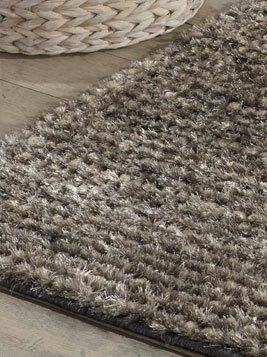 For low pile wool rugs, beater bar can be used after the first few months after shedding volume has decreased. Vacuum with the pile rather than against it. Clip loose ends or long piles rather than pulling them. Avoid direct sun. Minimize water exposure. 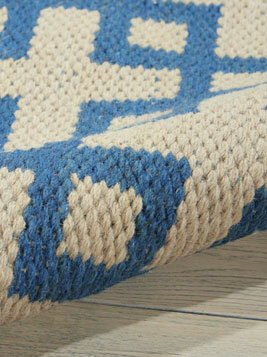 Do not use wool rugs in water prone areas like bathrooms and kitchens. Synthetic – Synthetic rugs like nylon, olefin, polyester and blends are typically colorfast and stain, water and mildew repellent making them a very easy care choice. Many of these rugs will hold up to direct sunlight, and some are designed for indoor/outdoor use. Outdoor– Indoor/outdoor rugs are most often made from olefin. When you use a rug outdoors, it will be susceptible to more dirt. Sweep or vacuum frequently without beater bar. Use mild detergent to wash and rinse thoroughly with garden hose. Hang to dry. Cotton – Avoid direct sunlight to minimize fading. Small cotton rugs can usually be washed in a home washing machine, for larger rugs use an industrial washer. Grass – For jute, seagrass and sisal rugs, minimize water exposure; avoid moist or humid environments like kitchens and bathrooms. Professional cleaning recommended. Leather – For leather, fur or hide rugs, shaking is preferred to vacuuming. If you choose to vacuum be sure the beater bar is off. For rugs with hair, use a wire rug brush to gently brush it in the direction of the hair. For rugs without hair, gently brush with a suede brush. Leather cleaner can be used for stains on leather rugs, but for tough stains professional cleaning is recommended. 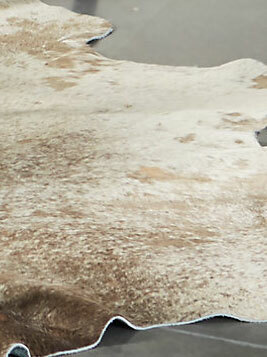 Avoid using any animal hide rug in direct sun or humid spaces. Silk – Silk rugs should be handled with care, vacuum weekly with suction only (no beater bar or brush). Blot spills immediately. Treat stains with club soda and blot dry, never use chemicals or cleaners on silk. Thorough cleaning should be left to professionals. Because of their high value and delicate nature, silk rugs are often hung on walls as art rather than used as floor coverings. Always use rug pads to extend the life of your rug, protect your floors, minimize movement and increase comfort. Periodically rotate your rug for even wear. Most rugs will hold their color longer if they are not exposed to direct sunlight. 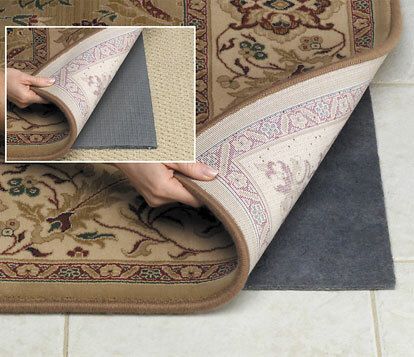 If the corners of a rug start to roll up then back roll the rug to help flatten them back out. Never use a beater bar on carpet fringe or long shag rugs. Taking good care of your rugs helps extend their beauty and usefulness.